Over the years, I’ve heard nothing but good things about Make Up For Ever’s coveted HD foundation. When I tried it (just on the back of my hand), I knew the finish would be far too much for my face – I prefer a much lighter coverage. 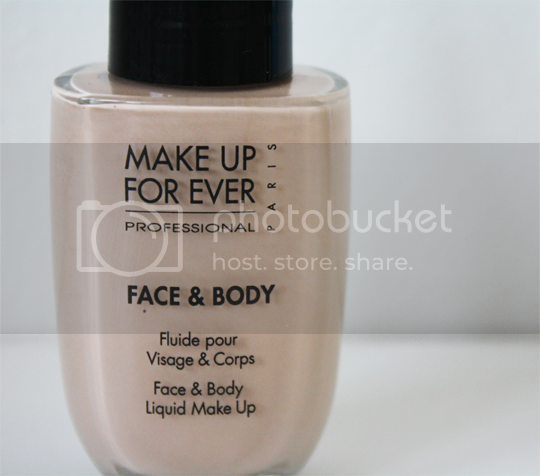 With that in mind, I decided to try out Make Up For Ever Face & Body Foundation instead. I bought this at IMATS, so there wasn’t much opportunity for colour matching. I went for the very lightest shade with a pink undertone, number 38, and I actually think it may be a touch too light for me but that’s okay, I can bring some colour back with bronzer. You may be able to tell from the photo above that it’s of a very fluid consistency – not too dissimilar from the feeling of Kryolan Ultra Fluid foundation. Also like the Kryolan foundation, this feels absolutely weightless on the skin but provides a less intense coverage. The coverage of Make Up Forever Face & Body is fairly light and sheer, but it’s very easy to build up layer by layer if you require a little more work on certain areas and it doesn’t seem to cake. 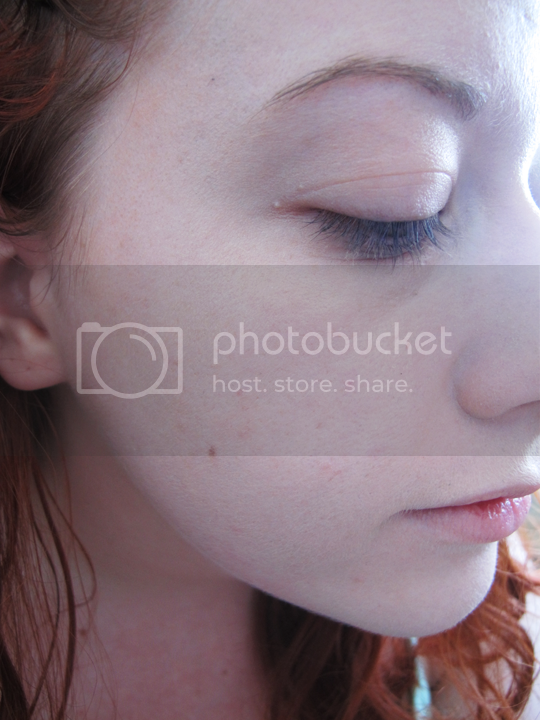 You can see in the before and after shots below how it just evens my skintone while leaving a very real, skin-like finish that’s neither too matte or too dewy. It’s waterproof formula means it’s been holding up quite well in the unexpected heatwave we’ve been having in the UK, although it’s not great with oil control (I will often need to blot once or twice throughout the day). Unless you’re very oily like me, this shouldn’t be a problem for you. I’d wholeheartedly recommend Make Up Forever Face & Body Foundation if you’re after an easy-to-apply, waterproof, light-coverage formula. If you prefer something a little more heavy duty, you might be better off with the HD foundation. If you fancy trying out Face & Body, you can pick it up in the UK from Guru Makeup Emporium or PAM. The UK price is around £30, which I think is good value for 50ml and a little goes a long way with this product. Overall, big love! Have you tried Make Up Forever Face & Body? Or its possibly more popular HD cousin? i might have to try this. it looks really good. It looks quite like Face and Body from MAC which is amazing ill have to give this a try! Looks like it makes quite a noticeable difference to your skin! Seems like the perfect thing for summer if its weightless on the skin because heavy cakey foundation makes me feel like my face is melting in this heat!! It’s a beauty and definitely one of my all time favourites but sadly I haven’t been able to find a perfect match (my closest is #20 but it’s still a tinge dark for my neck/chest). Really wish they’d bring out more shades. As someone else mentioned, if you’ve never tried MAC’s version of F&B it’s excellent also and with a better colour range.